What does it mean to BE "a healing presence." To be comfortable within yourself—open, curious, and compassionate--so you can be this way with others too, holding space for wholeness to emerge and for healing to happen. Why is healing presence so important in the world right now? We live in perilous times. We are in danger of losing our deepest, most precious connections to loved ones, friends & neighbors due to political, ethnic & religious differences. There are rifts to be healed in our beloved families. Rumi was right. As awakened humans, we need to hold space for the soul to re-emerge so we can remember who we are to one another. ​Feeling frustrated & failed by major institutions, many people today feel isolated & alone, with no one to talk with about what matters most. Everyday struggles mount up making some people feel angry or depressed, burdened or hopeless. You may be one of these people. 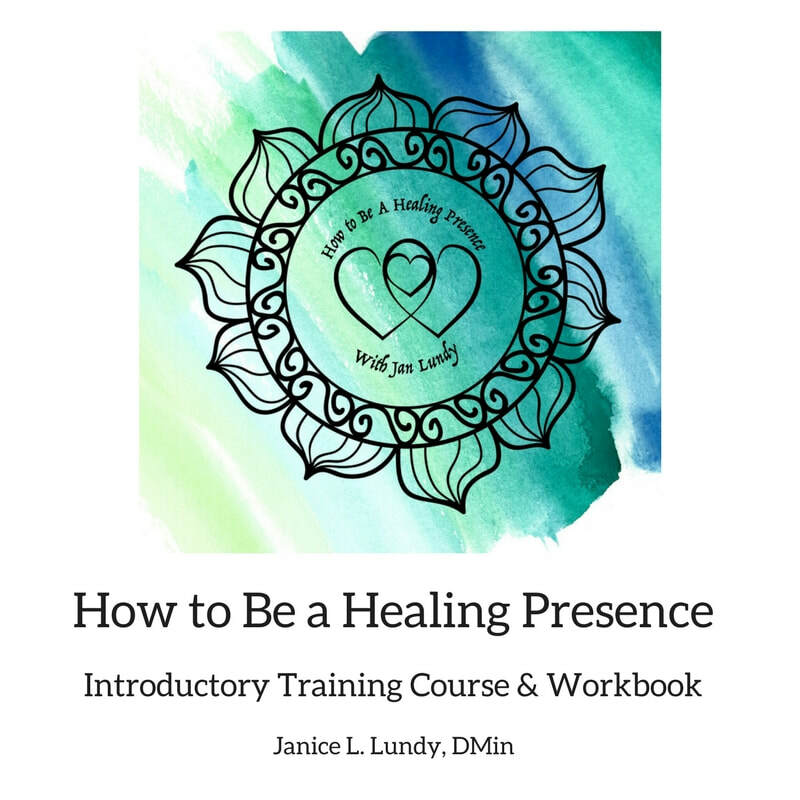 ​My new self-paced, training program, "How to Be a Healing Presence"
​improve the quality of your life and relationships. And help others along the way! to hold space and compassionate presence for yourself—no matter what you are thinking or feeling. You will be able to release hurts & hard-heartedness to be more open & compassionate with yourself. This reduces stress & emboldens joy! to offer & hold healing presence for others. You will learn how to prepare a space for others to feel welcome, seen, heard, appreciated & loved—even when their views and life choices are very different from your own. How do you become a healing presence? My new course & 60-pg. workbook will teach you how. • 15 self-paced written Lessons, 11 Mp3s, reflection questions & journal pages will guide you through the process. • You will be invited to practice conversing with others to by putting compassionate listening skills to work. ​for others through compassionate presence. ​• Know how to honor yourself & still be heartfully open to the views of others. • Develop deep acceptance of others—just as they are. • Understand what role the Divine plays in this process & how YOU can tap into It during conversations with others. With healing presence, we do not need to fix, repair or rescue anyone. We do not even have to offer advice. When we speak encouraging words, we take ourselves out of the picture. All we need to do is be present with people as they are, as things are. What a gift to both listener and receiver! From Lesson 10: "Encouraging Words," from How to Be a Healing Presence. As you work through this self-paced training, you are invited to share your experience with me via -email. Ask questions. Receive support! 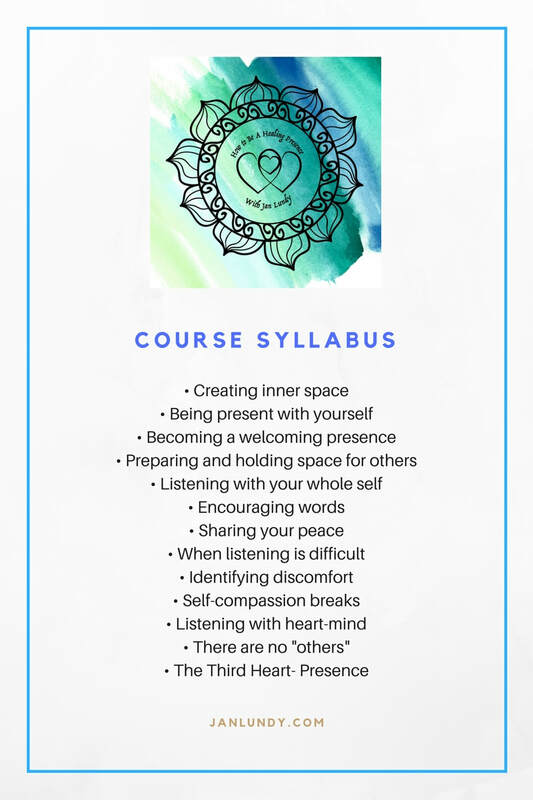 this training will introduce you to the method I created & have used successfully with seekers & clients for 15 years as a spiritual director and mentor. It is guaranteed to refresh and fine-tune your caring & communication skills. Download your training course & workbook. Give yourself the remarkable privilege of BEING a healing presence & help heal your little corner of the world. We need you. Every drop of compassion you offer will flow into the great Ocean of Compassion, making love and connection bloom again.